Did Samsung just tested the next Galaxy S based on low specifications? 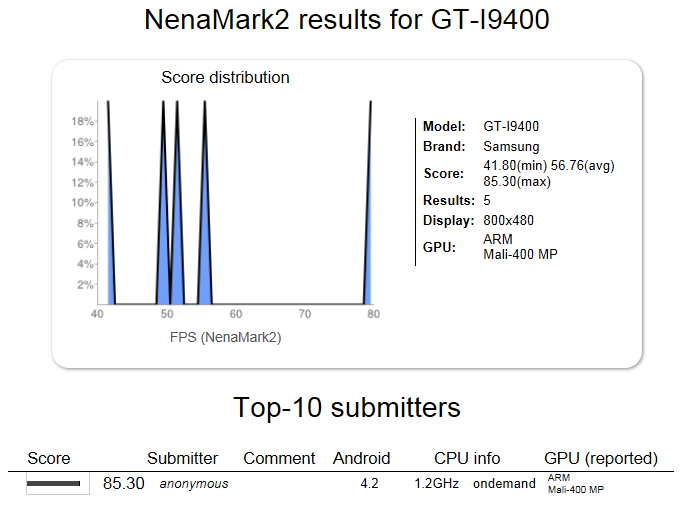 It seems so… The GT-I9400 just leaked through nenamark 2 benchmark. Of course, we have to say the leaked specifications looks absolute fake as Samsung will not use a WVGA resolution display or a dual core processor inside the next generation device of the Galaxy S. The good thing here is that Samsung has finally started to do Software tests on their next flagship device. (If GT-I9400 is the next Galaxy S) The first test firmware of the Samsung Galaxy S III GT-I9300 showed up in December. So yes, Samsung is right on time for May 2013! Reminder, the first Galaxy S III firmwares were also tested on a device with a resolution of 480×800 and a dual-core processor. So the picture below tells nothing! The name Galaxy S IV/Galaxy S4 isn’t sure… The number 4 is bad luck in South Korea…. We wil keep you infirmed if Samsung tests on more benchmark applications and leak new information. Special thanks to Daki from AndroidSlash.ch for tip. So nobody buys Nexus 4 in South Korea? I think it will be named S4, at least in Europe. Could also be the galaxy s2 plus i think the screen resolution is a little low for full HD. we are still waiting for the promised official jelly bean for galaxy s2. Samsung can easily trick nenamark or any othe test software about the hardware. Anyway, Samsung have to work very hard on S IV, couse competitors already released devices with 1080p display 4 core CPU, nextgen graphics and wireless charging. I don’t know what else to wish. The number 4 is bad luck in South Korea…. Correction if not mistake number 4 not means like that in South Korea.. WHEN WHERE SAMSUNG S2 STABLE FIRMWARE??? WILL BE?? NOT TEST!! Beyong: interesting point of view. I must admit, you have your five cents of truth, but as for the rest, Samsung have made their software better. Look at the S III, Note II and upcoming software for Galaxy S II. I believe they should go this way, because they are indeed lacking in the software deportment. Users need optimization, maybe not on the level of iPhone, but at least similar. Also, hardware surely needs to be really pumped up this time, comparing the competition, however software needs yet a stronger focus. when stable jelly bean for note n7000??? I don’t know about the rest but I don’t feel much excited about new phones. I mean what is the point when the softwares is substandard. To me it sounds like a mono tone speaker. It must be my literacy because I am finding it difficult to grasp the main points of the topics. Try to boost up excitement and importance so much that main points ends up in a salad bowl. READ 😉 Reminder, the first Galaxy S III firmwares were also tested on a device with a resolution of 480×800 and a dual-core processor.